Newsroom » News » How Does News Coverage Affect the World of Finance? How Does News Coverage Affect the World of Finance? 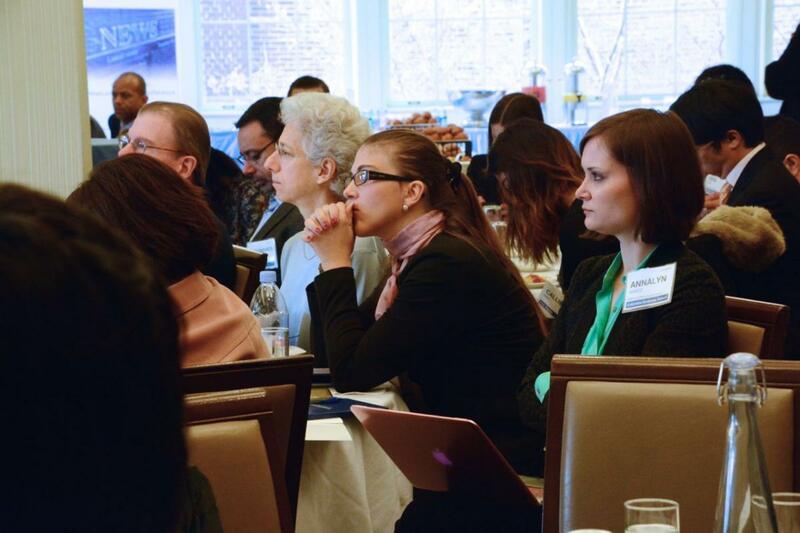 The 2nd Annual News and Finance Conference explored the interplay between the media and the markets through expert research, presentations, and discussions. Can a series of news articles make a stock rise? Can a tweet send a market into turmoil? Can a financial TV segment have a lasting impact on a firm’s performance? 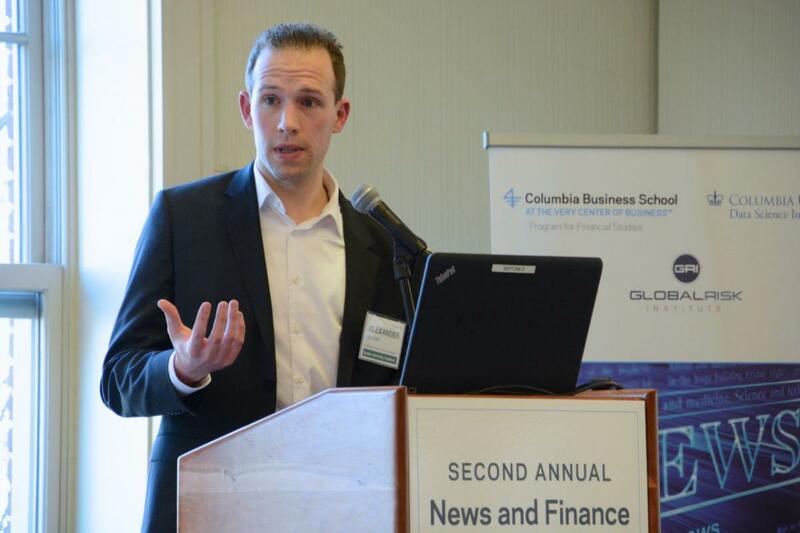 These are questions that experts gathered together to discuss at the 2nd Annual News and Finance Conference at Columbia Business School, organized by the News and Finance Initiative within the School’s Program for Financial Studies. The initiative is supported by lead industry sponsors Bank of America Merrill Lynch and JPMorgan Chase, and by affiliate industry sponsor Morgan Stanley. 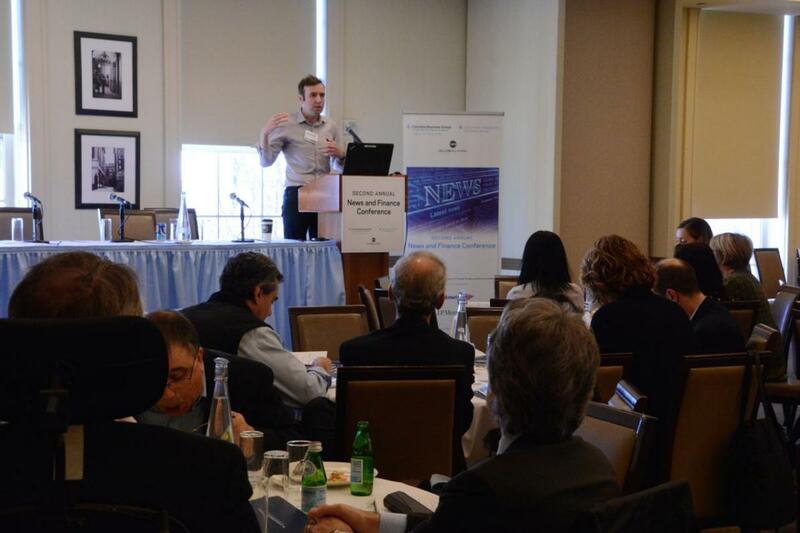 The enlightening day featured six research presentations, two panel discussions, and a keynote by Morgan Downey, CEO of financial data technology company Money.net. Each expert tackled a different angle of how news coverage affects financial markets. Do Investors Move in Herds? 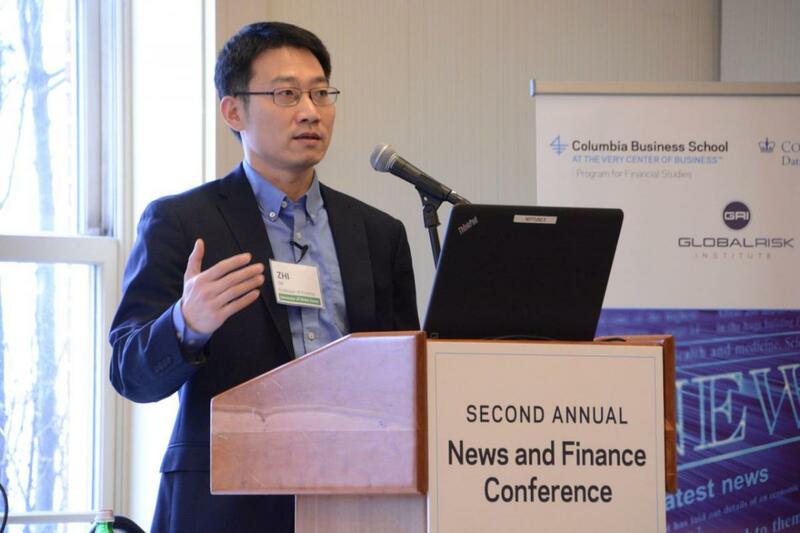 The first presenter was Zhi Da, professor of finance at the University of Notre Dame’s Mendoza College of Business, who studied the effect of a herding mentality on the accuracy of quarterly earnings estimations. By analyzing individuals’ guesses about upcoming quarterly earnings reports as entered in Estimize.com, a crowdsourced financial estimates platform, Da and his team found that while the average estimation of a large group is generally more accurate than an individual guess, this is only true when all the guesses are made blind or concurrently. In non-blind or sequential scenarios — where people have access to others’ guesses as they make their decisions — the average group estimate can actually become less accurate. “It’s possible that we could become individually smarter but collectively dumber,” Da said with a laugh. One might surmise that this could have broader implications for real-time investments, as widely publicized forecasts by influential investors — distributed via the media — could disproportionately affect other investors’ estimations of a particular company or stock, which in turn could lead to a less accurate assessment overall. What Is the Impact of Publicizing Financial-Stability Reports? 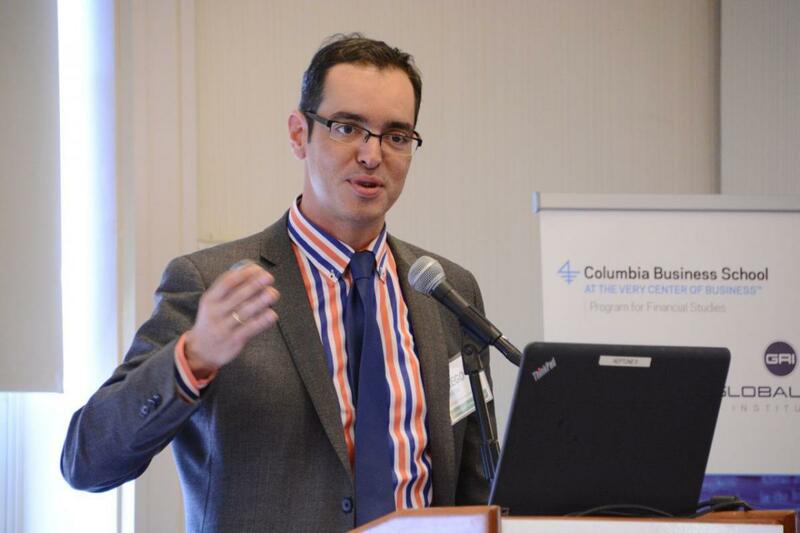 Next to present was Ricardo Correa, PhD ’06GSAS, chief of the International Financial Stability Section of the Board of Governors for the Federal Reserve System. Correa studied how central banks communicate their financial state (via speeches and reports) and how the press covers these communications, with the ultimate goal of determining how these communications can predict or impact a country’s economy. A central bank’s liquidity plays an important role in maintaining a nation’s financial stability, because in addition to setting interest rates for inflation control, central banks are also responsible for lending money to private banks during times of crisis. Prior to the financial crisis, the press didn’t often cover central banks’ financial stability reports, but evidence suggests this is changing, Correa said. And that could have a bigger impact on markets going forward, since he and his team found that this press coverage can have an impact on the markets. “Again, these are preliminary results so we still have to add more countries and do a more thorough analysis with this,” Correa added. Do Newspapers Hold Clues to Future Market Trends? “Further,” he added, “our results suggest that news can be used to ... forecast GDP growth quite well,” as well as “reduce noise” from non-predictive — and therefore unhelpful or misleading — sources and topics. This research could prove particularly useful as financial analysts look for new, fast, and low-cost ways to predict future movement and trends. Thorsrud’s presentation was followed by a panel discussion among four professional journalists: John Authers, senior investment commentator and “Long View” columnist for the Financial Times; Steve Liesman, senior economics reporter for CNBC; Ellen Pollock, former editor in chief at Bloomberg Businessweek; and Gregory Zuckerman, special writer for the Wall Street Journal. 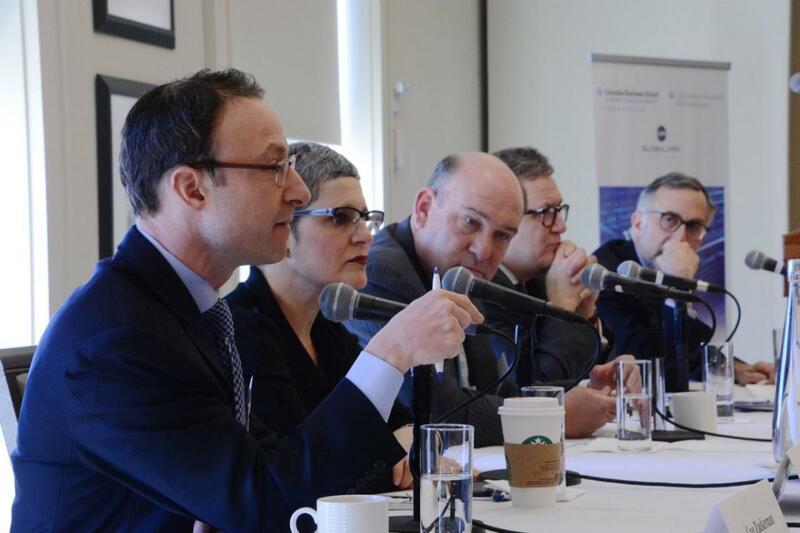 The panel was moderated by William S. Grueskin, professor of professional practice at Columbia University’s School of Journalism. This information could be a scoop, or it could help offer new angles to an existing story, ultimately providing financial professionals with more information — and better information — for their investing decisions. “There are some ways in which the electronic era has helped us, made us better,” Authers said. “It’s increasingly important for financial journalists not to be writing for only all of you,” agreed Pollock, addressing the crowd of highly knowledgeable economists and MBAs at the conference. “Financial journalism has to be for the industry and for regular people” — like those who are personally invested in the news because their 401(k) retirement accounts are reliant on stock performance, she said. “We have a diversity problem,” Zuckerman added. “There are not a lot of people from Kentucky and West Virginia and Alabama working in our newsrooms.” US news bureaus are largely located on the nation’s coasts, and as a result, journalists often seek out the same, familiar sources and regions when looking for and reporting on stories — like Silicon Valley for tech news, for example. 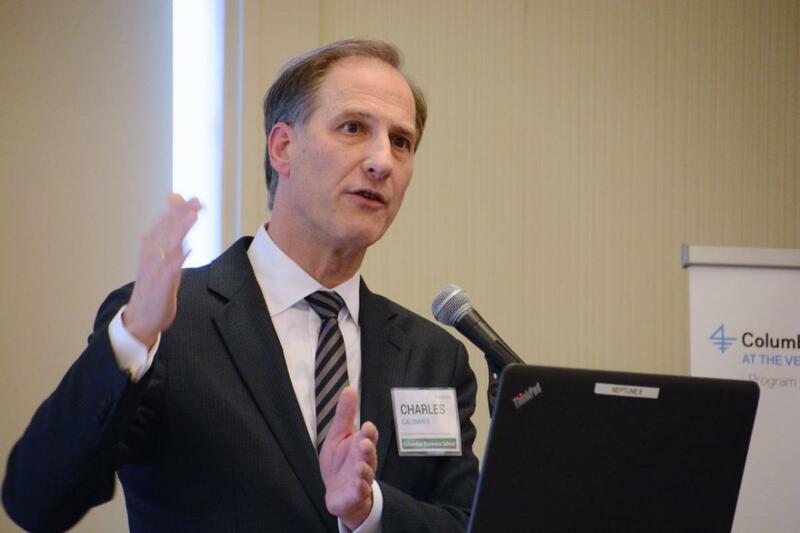 “It didn't really cross anyone's mind that there's technological innovation going on in Oklahoma, which was blowing the world away,” Zuckerman said. That’s because even in the digital age, this kind of information is usually obtained by those who are on the ground, witnessing it for themselves. “My wife, who is a fine journalist, her... immediate reaction to the US presidential election was, ‘You guys should all be opening bureaus in Iowa,’” added Liesman. The journalist panel was followed by a lunchtime keynote speech by Morgan Downey, a former commodities trader and current CEO of Money.net, a platform that provides financial professionals with data such as real-time US equity prices, commodity futures, breaking market news, updatable historical data, and graphical market analytics for a flat monthly fee. “Financial news is anything that will move a market,” Downey said. “It doesn’t have to be from a news organization like the Wall Street Journal or Financial Times. It can be from a whole bunch of other sources — social media, ... events.” For example, for a particular oil-related trade, Downey relied on tweets instead of traditional news sources, he said. On that note, one of the biggest challenges in delivering financial news is trying to remove the bias of its source, Downey said. But those making investment decisions don’t care where the information comes from, as long as it’s accurate and they can access it, he stressed. They just “want to know that information,” he said. 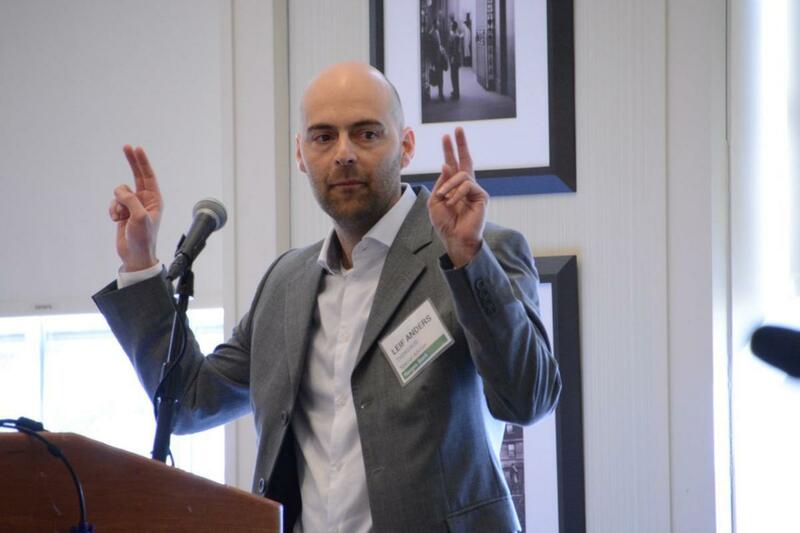 Downey’s talk was followed by a presentation by Diego Garcia, the Burridge Endowed Chair in Finance at the Leeds School of Business at the University of Colorado, Boulder. Garcia’s research focused on the nature of financial news — whether it was positive or negative — and its effect on the market. “What are these journalists writing about? Are they hyping good returns to make people feel good? Are they juicing bad outcomes to grab attention?” he said. Garcia’s research ultimately found that negative financial news is covered more often by the press. “[Even when] the stock market is going up, the journalists are using fewer positive words and more negative words. They seem to be hyping the negative,” he said, noting that this could be the result of a “better safe than sorry” approach. This conclusion could have implications for how financial professionals track and assess various markets, because if negative news is more widely covered and has a lingering effect, one might argue this information could color investors’ assessments. Charles Calomiris, the Henry Kaufman Professor of Financial Institutions and faculty director of the Program for Financial Studies, presented research he conducted with Harry Mamaysky, associate professor of professional practice and director of the News and Finance Initiative, on the lasting effect of news coverage on stock returns and risk around the world. As opposed to just looking at how a certain piece of news might move markets in a single day — or even a single 15-minute window — their research highlighted the importance of looking further ahead. To do this, they classified news based on a variety of factors, such as sentiment, frequency, and topic, and compared it with national-level market performance in 52 countries, dividing the countries into two categories: developed markets and emerging markets. Ultimately, their research found that certain types of news coverage can offer predictive insight into nations’ economic outlooks one year ahead — in some cases better than other factors commonly used, such as changes in related asset prices. The final presentation came from Alexander Hillert, the House of Finance Professor of Sustainable Asset Management at Goethe University, Frankfurt. His research found that more media coverage and better firm visibility among investors and consumers leads to higher returns and stronger sales. “Media coverage can serve as a substitute for product market advertising. If a firm gets a lot of media coverage, then this can help to attract consumers to a firm's products, and so consumers become aware of that product and consider buying this product because, if ... the newspaper coverage is positive, chances are it also improve[s] consumers' attitude towards the firm's products,” Hillert explained. Further, frequent media coverage can actually serve as a monitoring mechanism, exposing corruption or misbehavior and leading to future improvements in corporate governance. Hillert points to the example of Dov Charney, the American Apparel CEO who was fired because of alleged sexual harassment and inappropriate behavior with employees. “When the press reports about such corporate governance violations, such bad behavior, then there are actions taken to stop these inefficient and inappropriate behaviors,” Hillert says. Hillert’s research found that more visible firms become more profitable over the next three years, and that investors do not price in the benefits of this visibility adequately. The bottom line? Companies might want to invest in a good public relations department. 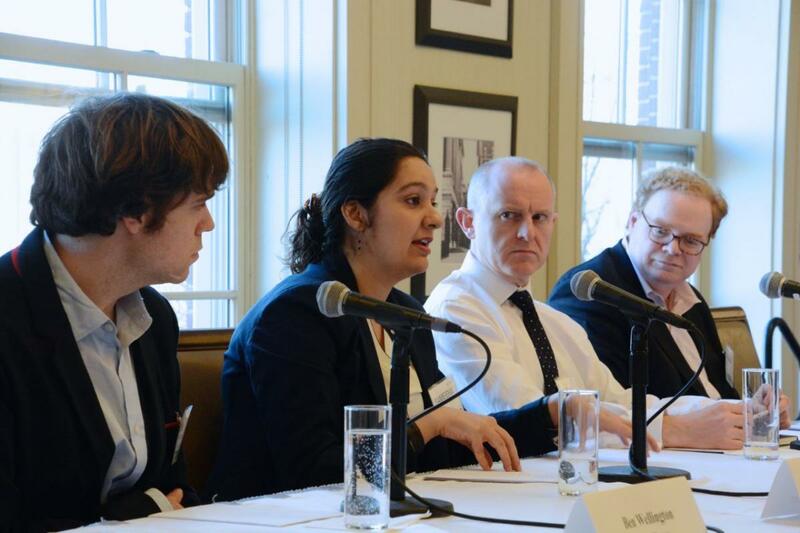 The conference concluded with a panel discussion featuring four finance-industry experts and practitioners: Graham Giller, PhD, chief data science officer at JPMorgan Corporate Investment Bank; Angus Lund, global head of AlphaWise at Morgan Stanley & Co.; Sameena Shah, PhD, director of research for Thomson Reuters; and Ben Wellington, managing director at Two Sigma. The panel was moderated by Wesley Chan, PhD, senior vice president at Acadian Asset Management. The conversation centered around the future of sourcing news in the financial industry, including the role of technology and how it facilitates — or hinders — the spread of useful information. However, she noted, while technology has enabled the quick, widespread sharing of information, it’s not very good at authenticating that information: “What Twitter is not great at is credibility.” That’s why Thomson Reuters has invested heavily in verifying the veracity of tweets, assessing their origin and any background on the tweeter that might prove useful, she said. The panelists also talked about how the context for statistics can color how those statistics are interpreted and internalized by the public. For example, Wellinton said, if you say there is a 20 percent chance of a hurricane hitting the region and the hurricane does hit, you’re a hero. But if you say there’s a 20 percent chance of a political candidate winning an election and the candidate does win, you got it wrong. “There's something wrong with that model. We're expecting different depending on the context,” he said. Ultimately, the panelists agreed that the future of financial news is one where technology is enabling more and more news to be reported, and to be reported quickly, but where humans are helping to curate it and deliver it to the consumer in the ways in which the consumer wants. 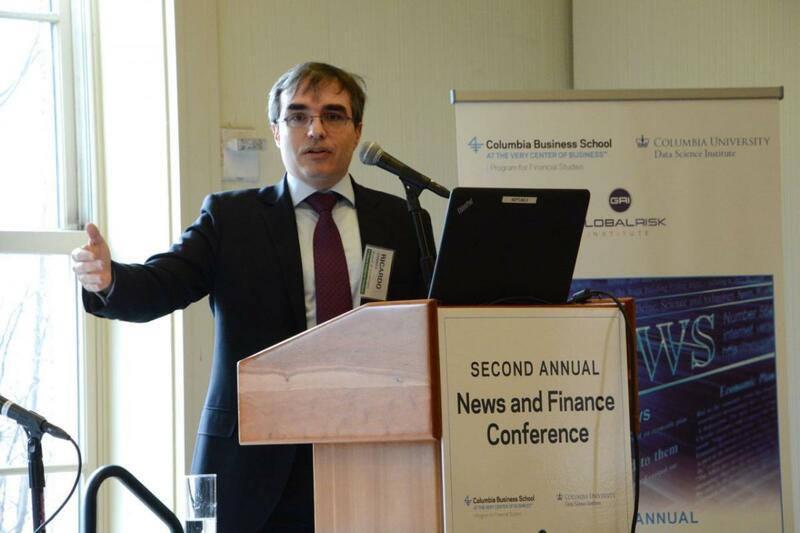 The 2nd Annual News and Finance Conference was organized by the Program for Financial Studies’s News and Finance Initiative, led by three Columbia Business School professors — Paul Glasserman, the Jack R. Anderson Professor of Business and director of the Risk Management Initiative within the Program for Financial Studies; Harry Mamaysky, associate professor of professional practice and director of the News and Finance Initiative; and Paul Tetlock, professor of business and assistant director of the News and Finance Initiative. 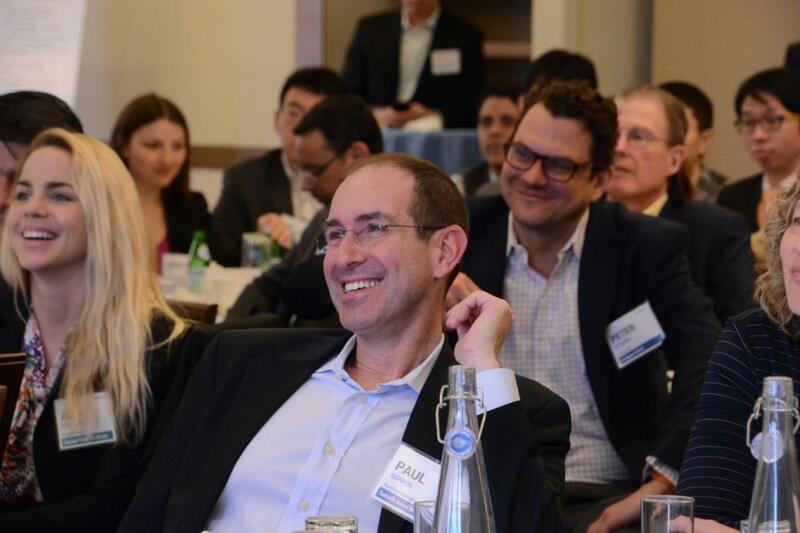 Thomas F. Coleman, chief research officer at the Global Risk Institute, and Columbia University’s Data Science Institute also helped organize the conference. The 3rd Annual News and Finance Conference will take place in the spring of 2018.